One of the key figures of Grambling’s football resurgence is saddling up and moving west. 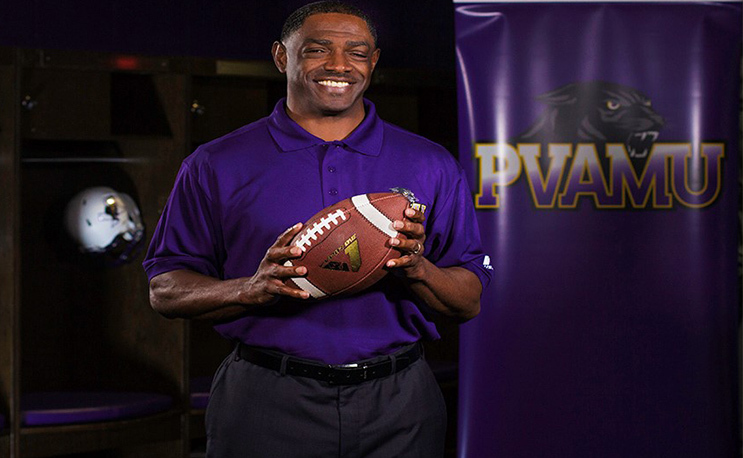 Eric Dooley is leaving his post as offensive coordinator at Grambling to take over as head coach at Prairie View A&M, the school announced on Friday morning. Dooley has spent the last four years as Broderick Fobbs’ right-hand man, helping Grambling reach at least the SWAC Championship Game in each of the past three seasons and coaching the SWAC Offensive Player of The Year in each of those seasons. A hot name on the coaching circuit, Dooley was thought to be the front-runner for several open jobs, including UAPB. Instead, he will fill the hole left by Willie Simmons who left after three seasons to take over as FAMU head coach. Dooley may be a first-time head coach, but he will be far from a novice. He’s won at every place he’s coached. Prior to his coaching career, Dooley played under legendary Grambling coach Eddie Robinson in the mid-1980s. He comes to a program that showed promise under Simmons, but never managed to beat SWAC West rivals Grambling and Southern in those three years. It appears Prairie View has decided if you can’t beat them, get them to join you.